God’s Trigger brings something new to the increasingly crowded genre of top-down, quick attempt shoot-’em-ups. It works just fine as a single-player game, which cribs the Hotline Miami campaign except with a character switch function, powerful abilities, and a progression system for both of its protagonists. But the game really sings when I load up co-op and play with a friend, giving each of us a protagonist to control. My husband and I share the same screen in local co-op. I take control of Judy, a demon with a ranged chain, and he handles Harry, an angel who sacrifices reach for deflection with his sword. We slaughter our way through angels, demons, actors, and bikers. The action is immediate, brutal, and flashy. As Judy, I’m capable of mind-controlling an enemy and using them as a tool to distract his buddies as we storm their room. As Harry, my husband is constantly flanking and dashing through combat, sprays of blood following him everywhere he goes. We advance through multiple steps of every stage, and we rely on each other to solve puzzles, help the other in tight spots, and use our unique abilities. Combat is relentlessly fast-paced and lethal. We stay alive by using our mobility dashes, dodging projectiles, and killing enemies before they can kill us. Boss fights are exercises in reading animations in time to skirt dangerous projectiles while we dance in and out to apply damage. A few moments require finer coordination. I open a door as Judy by standing on a pressure plate, and my husband activates Harry’s invisibility to slip past turrets and switch them off. Later, he relies on me to get through some narrow bars with my infernal blink and open a new route for us to advance through. 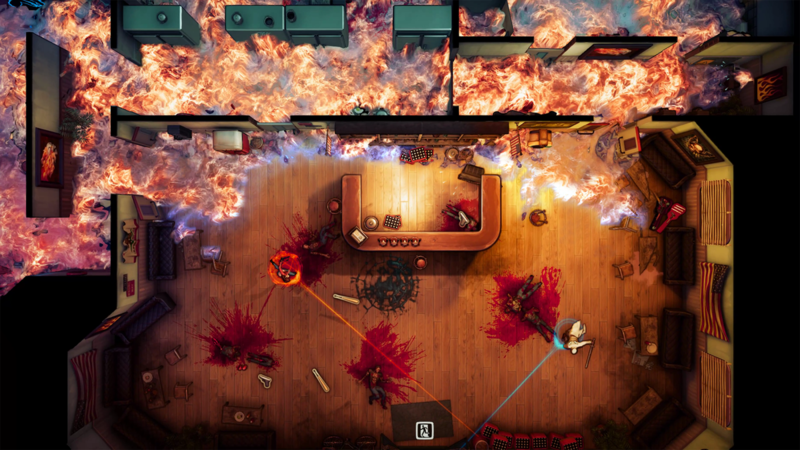 The best moments in games like Hotline Miami and The Hong Kong Massacre have a certain performance to them. I pull off a play I previously thought impossible — kick down a door, take out a guard, swing around a corner, and clear out a room with frightening precision. I feared a second player could get in my way, but in action, two players synchronize like a pair of dancers. It adds rather than interferes. Having another person changes the cadence of the campaign. Instead of the usual loop of die, repeat, die, repeat, die, repeat, it’s a little slower. We stop and handle a puzzle. We storm a room, he goes down, and I clear the enemies and then resurrect him. The pace becomes more deliberate and less frenetic. Co-op doesn’t feel grafted onto the base game; it feels like the way the game was originally designed. When I play alone, it’s easy to cheese the game. I learn that I can abuse line of sight to set up a meat grinder for enemies in narrow hallways and around doors. I can switch between Harry and Judy at any time to get access to their full arsenal, and take advantage of a frame of invulnerability that pops up during the animation that pulls one protagonist out and drops another one down. These tactics don’t ruin the game by any means, but I’m always aware that I can bank on them in a really tough spot. Having both Harry and Judy on the field doesn’t make the game trivial; it removes some of the cheesier tools from my kit. Any co-op game worth its salt needs to deliver narrative carefully. Too much info, and the rambunctious fun of playing with a friend is lost; too little, and the action becomes aimless. God’s Trigger neatly solves that problem by serving up a B-movie plot loaded with one-liners, simple characters, and straightforward motivations. When we level up, we get to excitedly chat about our new upgrades or that incredibly sick combo we pulled off in the previous stage. We don’t have to put our controllers down and quiet ourselves to watch an in-depth cutscene dwelling on the question of whether man is the real monster. Demons from hell are the real monster, God’s Trigger asserts, go shoot a million of ’em. That’s perfectly fine for a co-op game, and gives a fun vibe to the proceedings. There are a few technical flaws in local co-op and not single-player, such as an occasional inability for me to toggle the targeting system on enemies from afar if my husband has already marked them. I found that any issue could be solved with a reset, and the checkpoint system is generous enough that we never lost a significant amount of progress. God’s Trigger is a dynamic and ridiculous power fantasy. It’s satisfying to take the gameplay loop of a shoot-’em-up and share it with a friend. Adding a heaven-and-hell backdrop — along with all of the powerful abilities that allows — is just icing on the cake. The story is silly and shallow, the dialogue consists of one-liners and zingers, and all problems can be solved with judicious use of a chain flail. Finding a friend who’s down with B-movie fun and going through a cheesy, blood-soaked romp of a game is like watching late-night movies together on the couch while gobbling buttery popcorn. It’s an entertaining ride, and one that’s sweeter when shared with a pal. God’s Trigger will be released April 18 on PlayStation 4, Windows PC, and Xbox One. 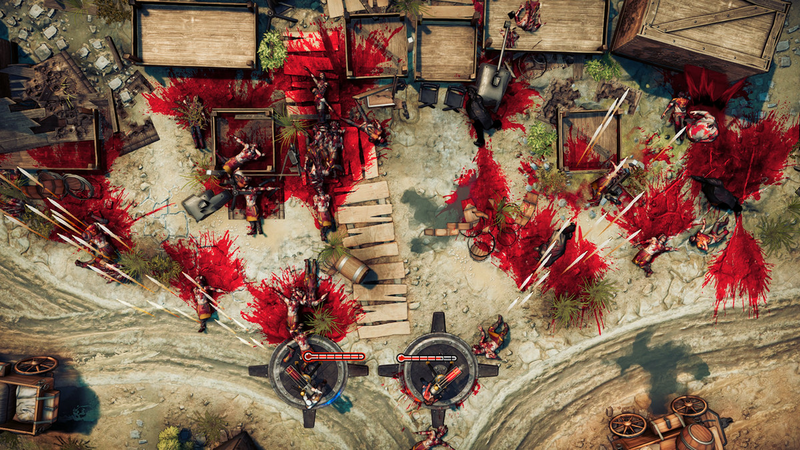 The game was reviewed using a final “retail” Steam download code provided by Techland Publishing. You can find additional information about Polygon’s ethics policy here.